My dream snuffed out again. The 30-plus year wait prolonged for at least one more. Swept away were my hopes and visions of a much craved celebration with friends and family. That's right, baseball season came to an abrupt conclusion when the chirpy Royals took four straight from my beloved Orioles. My suffering as a lifelong and borderline idolatrous Orioles fan continues and I often wonder if my mourning will ever turn to dancing. That last line was a little over the top. You can even say it may be insensitive and trivialize real suffering. But it did hurt to see my hometown team go down the way they did. But it didn't hurt in the same way as so many other bouts with suffering and grief. While I could begin to craft an endless blog about real experiences and periods of suffering and despair, a post that would look more like a theatrical monologue cleverly crafted so to tug at your heart strings, I'm not sure that would be helpful. I have all-too-often been frustrated by the overdramatization of human experience in efforts to generate intended human responses, or worse, religious encounters and confessions. But what I can say is that whether it's been conflicted relationships, death of loved ones, financial strain, vocational uncertainty, or bleak personal health diagnosis or the same of family members- even a child diagnosed with a chronic illness- suffering has not escaped me. That said, I have had more than enough walks in parks and spur of the moment car rides when I have hashed it out with God. Just ask the trees in Goose Creek Park or the steering wheel of my Honda CR-V. Yes, this youth pastor has had more than one verbal sparring match with the One who made all things. These are the moments when my faith is not so much strongest, but certainly most raw and honest. These are some of my purest, albeit colorful and brash, prayers. And what I love most about these encounters is how God doesn't respond to my rhetoric with ridicule or reason, explanation or false hope. God lets me go, cry, scream, and even accuse God of not responding. God listens and God hears when I can't stop asking, "why does life hurt so much sometimes?" "If death had a Facebook profile its interests would not only be putting people in the grave but also killing their dreams, their loves, their peace, their dignity." (Andrew Root, The Promise of Despair xii). Death is not only about being six-feet under and in a box. Death also lurks around in the forms of life sucking experiences of sorrow and despair. Death shows up when we feel alone even though we are surrounded by peers in the school cafeteria. Death shows up when a kid is given a sudden nudge in the hallway as a reminder that his or her classmates don't really value who they are. Death shows up when we have more than we can handle with schedules, exams, pressures of academics and athletics, even church, making us feel like we are never doing enough. Death shows up when we read about wars and disease, from Isis to Ebola. Death shows up when kids are diagnosed with both curable and terminal cancer. Death shows up when we lose our jobs and can no longer pay the mounting medical bills or student loans. Death shows up when we fight with parents, children, spouses, or closest friends. Death shows up when our dreams for ______ fail to come true. Death, yes, also shows up in dying and the loss of loved ones. You could say death not only has a lot of Facebook interests, but also a lot of friends and followers. So life hurts sometimes. A lot. And when it does, the tired cliches and Christian catch phrases are no help. At least not for me. "God let this happen for a reason..."
"God is trying to teach you something through this." "You just got to pray harder and trust stronger." "God has a perfect plan." There may be some truth to some of this, although I struggle with most if not all of them, but when we are face to face with the monsters of death and despair, in any and all of their ugly forms, religious cliches and photoshopped memes don't offer much hope. They actually dismiss suffering and become toxic distractions. They are like drugs that give us a cheap and false high that pulls us out of real life, even for just a moment, only to be let down when we come out of it. So what does the Bible have to say about suffering, despair and death? Better, what does the Jesus story tell us about how God responds to the monster of despair and dying we face all too often? I think the Lazarus story is one of the best places to look in John 11. "This illness does not lead to death...but so that God can be glorified." Jesus' initial response irks me. I think it bothered the disciples, too. Did God allow the death of a friend to happen for some sort of narcissistic reason to affirm God's insecure status as king of all kings? Doubtful. I wonder if Jesus is merely reminding us that even the worst of suffering God can and often does redeem and birth new life. Jesus may be able, unlike this blogging youth pastor and all my fellow humans, to see both the forrest and the trees. Still I don't find this particularly helpful and, when I was told my three-year-old daughter has juvenile arthritis, talk of God's glory was not where my brain or heart went. It probably will never go there. But I don't doubt that somehow God is and can be glorified in the midst of suffering like this. I just believe God's glory comes not through sadistic divine and predetermined plans but through varied forms of a chaotic and redemptive nevertheless. "He stayed there two days..." Why the delay? It's no wonder the disciples were confused, but Jesus knew despair is not and would refuse to be the end. While I wish God worked on my clock, God doesn't. But that doesn't mean God is not still working. God is always on the move and especially laboring for the sake of all those who suffer. So while God may appear slow, and frankly you can't convince me otherwise, we trust that while two days of waiting for our own Lazarus deliverance may be long, the third and fourth days are coming. Both the resurrection of Lazarus and the empty tomb of Jesus are reminders of death's great eviction notice. The stench of despair will soon be no more and the world will be delivered and once and for all restored. 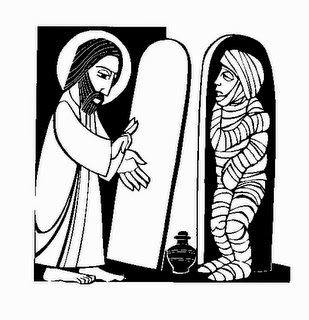 "But let us go to him..." Jesus enters into the suffering of others and runs towards those who are caught in death's grip. We are to do and be the same. While we may be tempted to buy bigger rugs, so the hurt and pain can be more easily tucked away, Jesus lifts up the dusty throw and shakes out the grief. God's people are even dared to expose all forms of death and dying as we carry our cross alongside those who lay in the wake of destruction, despair, oppression, conflict, and shattered dreams. "I am resurrection and life..." The reality is that Lazrus did eventually die, again. I am not sure what would've hurt worse for his sisters, Lazarus' first or second final breath. It probably doesn't matter. What does count is the promise, Jesus is the resurrection and the life. Death is not God's final word. Grave clothes are not our final attire. The stench of decay will eventually be overcome by the fragrance of a feast and the scent of celebration. Life will win out in the end, and not just for Lazarus. And if Jesus is the resurrection, we are to be those who point towards it and practice it as we follow him in a world with more than enough reasons to grieve. "Jesus began to weep." God is not beyond empathy and feels our sufferings alongside us. God is not immovable and out of touch. As Andrew Root writes, "God knows death from the inside...God works life out of death; God brings possibility out of nothingness." (The Promise of Despair 86). God, much like a good friend or parent who has been there before and yet does not rush towards answers, reasons, or cheap religious cliches, when we are in our darkest hour, Jesus wraps his arm around us and cries with us. It's not right. God knows it's not right. And God refuses to quit acting until all is right and good again. "I know that you always hear me..." God hears the prayers of suffering people. So while we may find it difficult to pray, Jesus has been praying with and for us and the broken world we inhabit. And when our prayers are raw, honest, are borderline disturbing and more accusatory than filled with gratitude, God hears them, too. "Unbind him, and let him go." We are called to enter into the suffering of others, weep alongside them, and work towards their deliverance, too. Lazarus will die again, which means the mission of the church is to work towards his unbinding until the return of Christ and the whole world's liberation. The mission of the church is to share this news with the whole world, and sometimes the best way to share the message is not by words or kitschy cliches but to simply shed tears, too. After all, that's what Jesus did. If I am confident of anything it's this: God does not cause suffering for some sort of sick and twisted plan to teach us a lesson or strengthen our faith. No. God enters into suffering and cries right alongside us, whispering hope and comfort until the day comes when there are no more reasons to weep, mourn, grieve, or lament. Sometimes the best news to hear, or maybe feel, is that in Jesus God weeps. God cries. That's because God also feels and hears our prayers of pain and anguish. That's the greatest message of the Lazarus story. It's actually the message of the cross of Christ. Jesus goes to the cross as a reminder that God never, not for one second, runs from human suffering. No. When we are at our darkest hour God dives in and weeps with us, sings alongside of us, and tilts our head upward to a cross and tomb both empty and a promise for resurrection and healing just over the horizon. That's what keeps me going in the midst of so much suffering. That's what gives me hope and faith when life hurts so badly sometimes. That's what allows me to comfort others in their sorrow, too. A simple message, God is with you. God is here. Jesus, who was crucified and burried, who suffered and died, is the resurrection and the life. The monsters of death and despair are not the end. So, why does life hurt so much sometimes? But it won't hurt forever. But my longing for a World Series Championship, now that's another story.